The TVS Jupiter in our opinion is among the best 110cc scooter that is on sale in India. The base version of the Jupiter has been priced at Rs 49,666 (ex-showroom, Delhi). 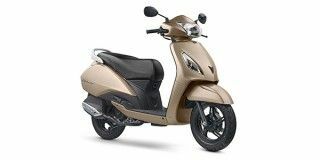 Long list o features, metal body and frugal engine make it a great combination and this can be gauged from the fact that it is among the most popular scooters on sale in India. Share your experiences with Jupiter? Q. What is the best price of recent model of Jupiter and Activa 5G? Q. TVS Jupiter Classic 2018, Suzuki Access 125 and Vespa 125, which one Is better? Q. Maine suna hai k Jupiter k back wheel K niche Se haath dale to wires Todkar seat and petrol tank koi b open kar sakta hai without key. Kya Ye such hai? Isi vajah Se Mai Jupiter Lena ruka hu. Q. Is it a best scooter? Q. Doess Jupiter Grande have metal body? Q. In TVS Jupiter which variant is best?